The Sun recently ran a story about how a First Essex Buses driver won a wrongful dismissal employment tribunal claim after testing positive for cocaine following a saliva drug test. The tribunal made a £37,000 award after hearing evidence from the driver that cocaine entered his system because ‘students gave him contaminated banknotes’. He also claimed he regularly licked his fingers as they were frequently sore from his blood sugar checks for diabetes. This echoes a similar case from 2015 when a Bristol bus driver won a claim for unfair dismissal after he was sacked for failing a drugs test after handling banknotes with traces of cocaine. In this case the driver was asked to take a saliva test at work to check for drugs after handling hundreds of pounds in cash that day. The saliva test proved positive. In both cases the drivers professed their innocence, independently providing hair specimens for testing. However, despite both drivers then testing negatively for cocaine, their respective employers rejected the evidence and refused to re-instate them. Problems can arise when organisations either don’t have or don’t correctly apply an effective, up-to-date drug and alcohol policy. In the cases cited above, both drivers ended up losing their jobs while their respective former employers both had to pay significant compensation. While we don’t know all the details of these cases, it’s fair to say that these outcomes weren’t ideal. So how can organisations prevent these kinds of cases from happening in the first place? The answer lies in having an active and robust drug and alcohol policy for your organisation that applies to all staff. It should form part of your overall health and safety policy, and also follow HSE guidance on drug and alcohol testing policy. Drug screening or testing is obviously a sensitive issue because of the many employment implications involved. However, it’s important that it’s seen as part of an organisation’s broader occupational health policy – and is clearly designed to prevent risks to both drug misusers and those around them. Additionally, screening by itself should never be seen as the complete answer to identifying or discouraging drug use. It’s important for companies to train their managers how to spot the signs of possible substance abuse and to let employees know how to seek help if they suspect drug misuse by a colleague, or have a problem themselves. A positive screening result must always be supplemented by a professional assessment of the employee. Specifically, any issues related to fitness for work should always be referred to the company’s medical representative (MRO) who would want to gather further evidence – such as collecting further samples for unequivocal laboratory-based test result confirmation and considering observational factors – before progressing the process. At Intelligent Fingerprinting we believe it’s vital that organisations take all factors into account when looking at a result. Has the employee demonstrated any other signs of drug use? What is his or her work record like? Someone with a previously clear record who is an exemplary employee is unlikely to be taking cocaine before their work shift. In the First Essex Buses case, the driver’s union – Unite – said that the driver was ‘plunged into a living nightmare’, while the tribunal for the Bristol bus driver described his investigation as ‘flawed’. Under European guidelines for workplace drug testing, it’s recommended that drug testing should only be conducted as part of an existing drugs policy, and that any testing respects the dignity of the individual involved. The Information Commissioner’s Office (ICO)’s employment practices code is clear in its recommendations, insisting that information obtained through drug and alcohol testing is subject to rigorous integrity and quality control procedures. The ICO also suggests that positive test results are interpreted by an organisation that is suitably qualified and competent in the field of drug testing, and that employees have access to a duplicate of any sample taken to enable them to have it independently analysed as a check on the accuracy of the employer’s results. The ICO further advises that employers shouldn’t always assume that their initial drug test is infallible, and that they should be prepared to deal properly with disputes arising from their use. The ICO points out that organisations should use ‘the least intrusive forms of testing practicable’ to deliver the benefits to the business that the testing is intended to bring. Intelligent Fingerprinting’s revolutionary, non-invasive drug test products – which work by collecting and analysing the minute traces of sweat contained in a fingerprint sample to screen for the presence of target drugs or drug metabolites – directly address this recommendation. 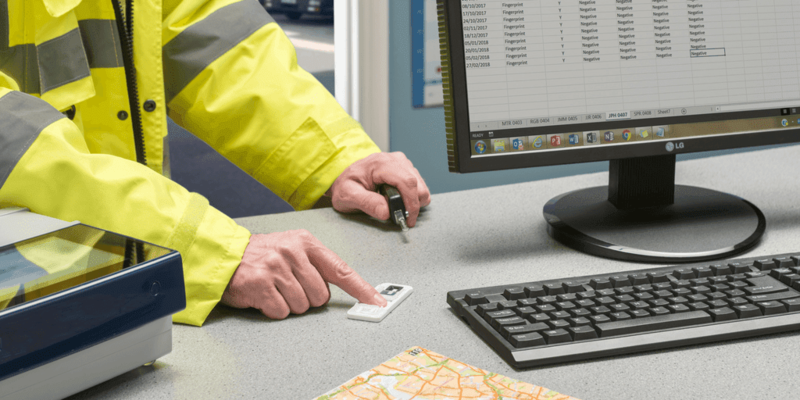 Our solution is designed to make workplace drug testing simpler and more convenient for everyone, whether you’re carrying out a test or providing a sample. 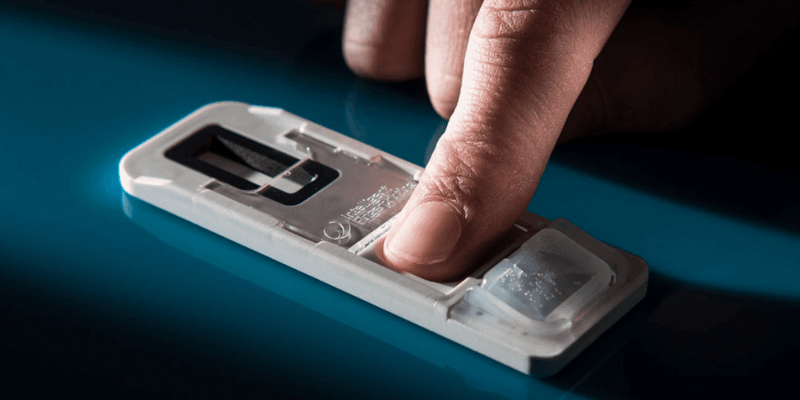 The system is quick, dignified and hygienic, and it takes just five seconds to collect a fingerprint sample using our compact drug screening cartridge. Once collected, a dedicated reader is used to analyse the fingerprint sweat sample, with a positive or negative result for each drug in the test available in only ten minutes. In a workplace drug screening scenario – such as the incidents reported in the Sun and the Daily Telegraph – if an initial drug screen indicates the possible presence of a drug (above a predefined cut-off level), a confirmation test is typically required. Should a result be positive following fingerprint testing, a Fingerprint Collection Kit for Laboratory Analysis is used to collect and send off fingerprint samples for laboratory verification of the results. We work with a third-party laboratory to offer a quick, confidential confirmation service when the reassurance of an unequivocal test is required. If you are thinking about implementing or updating a workplace drug and alcohol policy for your business but you’re not sure where to start, then we can provide support and guidance. We can help you create a drug and alcohol policy that provides a robust and comprehensive agreement between you and your workforce to promote a safe and drug-free environment. In addition to this, we can provide drug awareness training to help you educate your staff on spotting the signs of substance abuse in the workplace. For expert advice call our team on +44 (0)1223 941941 or drop us an email.